Sole hammered 14 fours and four sixes in a knock Hunts manager Rob Vitas described as ‘awesome’ as HUnts reached their victory target of 187 in under 18 overs. Captain Jon Carpenter made 43 of an opening stand 118. Late call-up Ryan Evans of Castor CC took 4-30m for Hunts. 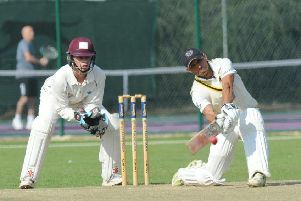 Peterborough Town’s Vansh Bajaj struck 34 for Cambridge MCCU. Cambridgeshire also put some Cambridge students to the sword in a friendlay at Fenners. The minor counties side amassed 415-3 in their 50 overs with Craig Park and Eddie Ballard contributing unbeaten tons to set up a huge 167-run win. Peterborough Town’s new signing Josh Smith struck 51 and 90 in weekend friendlies away to Notts Premier Division clubs Kimberley Institute and Plumtree respectively. Town were beaten at Kimberley, but won a tight game at Plumtree. Long Sutton won their opening South Lincs Premier Division match of the campaign beating Graves Park by 76 runs. Jake Burton claimed 5-10 as Graves Park were dismissed for 87. South Lincs League: Premier Division - Long Sutton 173 (B. Stanway 36) beat Graves Park 97 (J. Burton 5-10) by 76 runs. Division One: Boston 3rds 162-8 lost to Welby Cavaliers 185-9 (M. Dale 58, V. Matta 45). Friendlies: Kimberley Institute 284 (Josh Smith 2-41, L. Bruce 2-51, D. Sayer 2-59) beat Peterborough Town 240 (Josh Smith 51, S. Howard 49no, D. Sayer 38, D. Clarke 26, C. Parnell 22) by 44 runs. Peterborough Town 226-6 (Josh Smith 90, N. Paskins 33, D. Clarke 28, C. Milner 24no) beat Plumtree 219-7 (D. Malik 3-23) by 7 runs. Cambs 415-3 (C. Park 126no, E. Ballard 101ret, J. Bowers 46no, B. Seabrook 46) beat Cambridge University 248-8 (A. Moen 117, L. Hill 3-51) by 167 runs. Hunts 187-2 (T. Sole 87, J. Carpenter 43, M. Levine 34no) beat Cambridge MCCU 183 (R. Evans 4-30, M. Milner 3-37) by 8 wkts.